Recognize alumni for the remarkable difference they make at Rollins, in their profession, and in their community. 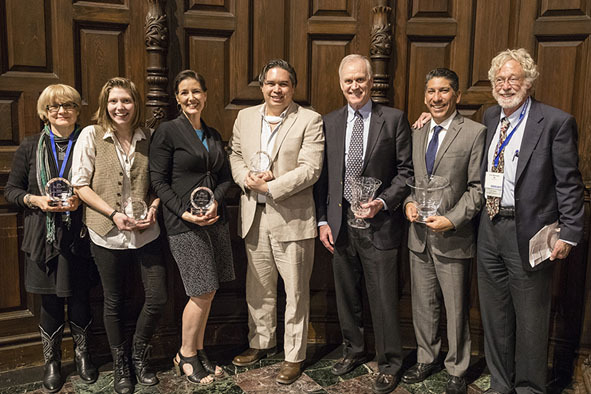 Award recipients Beth Lincks '75, Grace Loescher '14, Libby Schaaf '87, Angelo Villagomez ’04, Richard Spencer '76, Jose Fernandez, Jr. '92, and Eric Harrison '64 received their awards at Alumni Weekend 2018. Know an alum who's doing great things? Our alumni go on to achieve a lot of different things after their time at Rollins. Some even inspire others through the work they do in their industries and regions. Our Alumni Awards celebrate the outstanding accomplishments and service of our alumni who add to Rollins’ distinction as one of the nation’s leading institutions of higher learning. Each Alumni Weekend, recipients are presented with their award during Alumni Convocation. Know someone who is doing something amazing?